Current Australian International Player started his football career as a Redback! Aaron Mooy is currently one of most influential players in the Australian national team and plays for Huddersfield Town in the English Football Championship League Side while on loan from Premier League giants Manchester City. After a tremendous season in 2016/17 he was recently selected for EFL Team of the Season. Did you know that Aaron was born in Sydney and before playing junior representative football with the NSW institute of Sport he started playing with the Redbacks! He has stayed connected to the club and whilst preparing the A-League final series for the Western Sydney Wanderers’ fairytale debut season in April 2013 he came down to our home ground at View Street to chat with players and sign autographs. 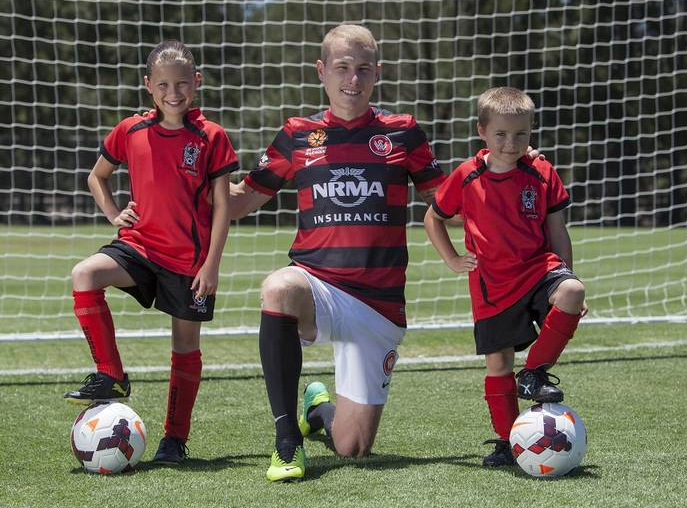 Here Aaron is pictured with Redbacks FC Juniors Elise Bell and Joshua Sutton. Mooy played in the UK in 2006 to 2011 before returning to Australia in 2012. He has been capped by the national team on 21 occasions, netting a total of 5 goals. He also played in the 2009 FIFA U-20 World Cup. He is considered by many to be a forthcoming star for the Socceroos due to his unprecedented rise in talent.